Leaked Star Wars 9 Art Shows Old Lando, New Characters & Kylo's Mask? 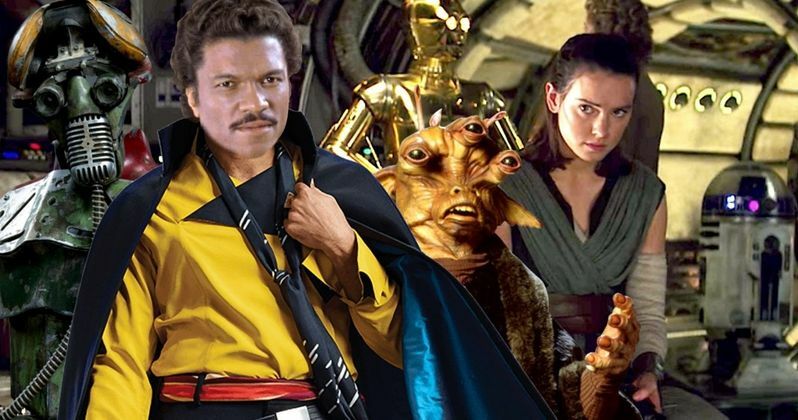 Star Wars 9 still doesn't have a title, but we may have our first look at a bunch of new characters, along with updated costumes for our returning favorites. Also included is our first hint at what Billy Dee Williams will look like as Old Lando. And Kylo Ren has his mask all fixed up and repaired with that red glue-like substance we heard about in a previous rumor. The images were posted by a Redditor going by the name JediPaxis. There is no indication that what we see here is authentic Lucasfilm art. But the character designs and updates match some of the rumors we've heard previously. If this does pan out, we get our first look at a couple of the new actors, with their characters hinted at, yet not named. In the A block we have one of the new aliens that will be shown in Star Wars 9. He wears goggles and a scarf, with a holster around his waist. The unnamed creature has a white mustache, appearing older and friendly. He's ready for flight or battle, and most likely an ally to the Resistance. In Block B we have our alleged first look at BB-8's new side kick, a droid that will reportedly bother and annoy his counterpart in what is described as a C-3PO and R2-D2 type relationship. Block C allegedly gives us our first look at Richard E. Grant's unnamed character. There were early rumors that he was playing Thrawn. But he appears to be playing a human First Order Officer. In Block D we get our first look at the new Resistance Soldiers. This matches with E Block, which gives us our first look at Dominic Monaghan as a Resistance Officer who has a vendetta against the First Order though he's not entirely on the good guys' side. Block F gives us another look at an unnamed alien. Block G shows off one of the Young Mon Cal, who may be related to the recently decease Admiral Ackbar. Next to him in Block H we get to see Rey in her new all-white ensemble. Block I gives us a hooded Kylo Ren, and in Block J, we see Kylo Ren's fixed helmet, which shows off the blood red bonding material that he reportedly uses to glue it all back together. Poe returns in Block K, wearing what is being referred as his Adventure Costume. And in Block L we see another Alien mask, though it's noted as being 'unfinished'. Moving onto the last row of reveals, we see a 'Horned Pilot' in Block M, supposedly one of the Resistance allies. Block N gives us yet another new alien, this one not exactly on the good guys' side. Perhaps a background player that doesn't get much screen time. Finally we come to Block O, which gives us our very first look at what is being referred to as Old Lando. Billy Dee Williams is rumored to have only signed up for a small cameo. He returns in his yellow satin shirt and cape, looking very much like the Lando we saw Donald Glover play in Solo: A Star Wars Story. The costume is definitely a call back to that standalone, and not Empire or Jedi, which may confuse and upset some fans. Does this mean we're getting the controversail Pando Lando in this sequel? In the final P and Q Blocks we get a look at even more aliens. It's not unusual for a new Star Wars movie to be introducing so many unique creatures. It's expected. And makes for an exciting Star Wars 9 toy line. Aside from the descriptions of who each character is, there are no solid details, or even names given for the new guys in the bunch. The concept only shows one female character, being Rey. Though it looks like the Aliens in P Block are feminine in nature, though we wouldn't want to assume their gender. This concept art has not been verified at this time, so it could be fake news. But it's quite authentic looking to some of the art leaks we've seen in the recent past. Poe's costume does match set photo leaks from last year. J.J. Abrams returns to direct Star Wars 9, which will bring the Skywalker family saga to a close, leading to new trilogies that will have noting to do with the reestablished characters. Starring in the movie are Daisy Ridley, Adam Driver, John Boyega, Oscar Isaac, Lupita Nyong'o, Domhnall Gleeson, Kelly Marie Tran, Joonas Suotamo, Billie Lourd, Keri Russell, Matt Smith, Anthony Daniels, Mark Hamill, Billy Dee Williams and Carrie Fisher, with Naomi Ackie and Richard E. Grant. We'll all finally get to see Star Wars 9 when it hits theaters this December. This latest alleged leak spilled out on Reddit.